Under terms of a deal announced April 2, officials at Burris Logistics said Trinity will take over the operations of Burris Freight Management, a division that provides freight brokerage services and specializes in handling produce shipments. The company will keep its name and operate as a new division under the Burris corporate umbrella, company officials said. Both companies are family-owned with Burris tracing its origin to 1925 when John Burris and his father, Edward, began hauling tomatoes from the Delmarva Peninsula into Philadelphia. Now headed by fifth-generation family members, the company operates a warehousing and distribution business stretching from Maine to Florida and as far west as Oklahoma. Burris Logistics ranks No. 63 on the Transport Topics list of top dry storage warehousing firms with 2.7 million square feet of storage space in 13 facilities. The company recently opened its newest warehouse in McDonough, Ga., and is starting construction of another facility near downtown Philadelphia. Ed and Deana Banning launched Trinity Transport in 1979, passing the business to their oldest son, Jeff, in 1991 and later changing the name to Trinity Logistics. The company operates five offices, along with 100 agent-owned offices in North America. It handled more than 350,000 shipments, generating gross revenue of just over $555 million, in 2018. The company ranks No. 17 on the TT list of top freight brokerage firms. Nick Falk, president of Burris Freight Management, said he expects the combined operations to benefit from increased buying power, scale and advancements in supply chain technology. “Both providers have dedicated technology teams, which will allow us to grow technology platforms to attract new customers, carriers and agents,” said Falk, who will stay on as Trinity Logistics president once the acquisition is completed later this month, according to a Trinity spokesperson. Billy Banning, currently Trinity Logistics’ president, will shift his focus to working with the company’s independent freight agent division, the spokesperson said. At Burris, Falk headed up a freight brokerage business that generates about $100 million in annual gross revenue and acquired Streamline Logistics, a freight brokerage firm based in Ankeny, Iowa, in May 2018. Falk told Transport Topics that the deal with Streamline brought on some new key customers and a network of carriers that extended Burris’ reach beyond the I-95 and I-75 corridors in the eastern part of the country. The company also expanded its brokerage services to include intermodal, less-than-truckload and home delivery. At a dedicated facility in Oklahoma City, for example, the company is providing order fulfillment for refrigerated and frozen items, including custom curated meat selections, soups, pet food and dietary supplements and shakes, Falk said. Falk said he is hopeful the merger with Trinity will spur more growth and allow for greater investment in technology with the goal of becoming an “end-to-end service solution” for shippers. 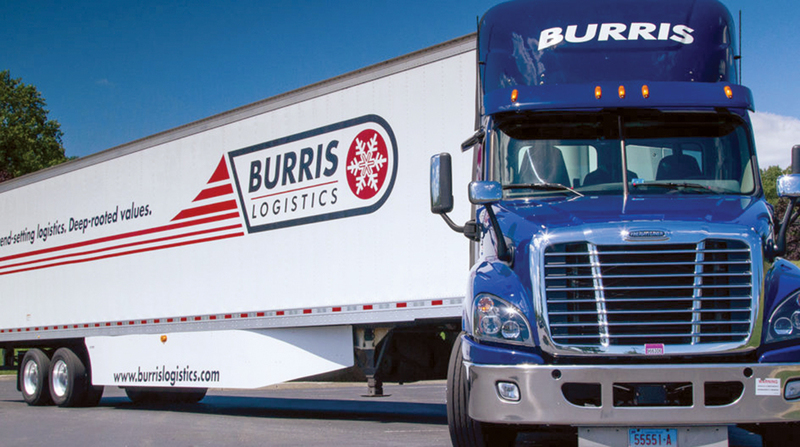 In addition to freight brokerage, Burris Logistics operates Burris Custom Distribution, Burris Public Refrigerated Warehousing and Honor Foods, a re-distributor of frozen, refrigerated and dry food service products. Burris Logistics operates a fleet of about 250 tractors and 450 trailers, company officials said.